Decorator pattern adds additional features to an existing object dynamically. In this post, I will use a simple example - decorate your girlfriend - to illustrate how decorator pattern works. Let's assume you are looking for a girlfriend. There are girls from different countries such as America, China, Japan, France, etc. They may have different personalities and hobbies. In a dating web like eharmony.com, if each type of girl is an individual Java class, there would be thousands of classes. That is a serious problem called class explosion. Moreover, this design is not extensible. Whenever there is a new girl type, a new class needs to be created. Let's change the design, and let each hobby/personality becomes a decorator which can be dynamically applied to a girl. Girl is the abstract class at the top level, we have girls from different countries. With a GirlDecorator class, we can decorator each girl with any feature by adding a new decorator. We can add more method like "Dance()" to each decorator without any limitations. A typical usage of Decorator pattern is Java IO classes. Here is a simple example - BufferedReader decorates InputStreamReader. InputStreamReader(InputStream in) - bridge from byte streams to character streams. InputSteamReader reads bytes and translates them into characters using the specified character encoding. I think you could have chosen another example. This is a really good website, however, you really don’t need such an example to make your point. Maybe the predominantly male software engineers do not find this offensive ( and understandably so). As a woman who is also a software engineer, I find this objectifying women in general(unnecessary, because I understood Decorator just as well without the need to ‘decorate’ a girlfriend). Maybe some men might find my comment unnecessary, but in a field that already has such a low female population, I think we need to stop alienating women by creating such examples (which are not only unrelatable, but also offensive). I would really appreciate you changing this example. This is so sexist..you could have chosen a better example. For example girl2 might have feature one and feature two, girl 3 has feature 4 and 5. Without decorator pattern, you need to create more subclasses. Let’s say there were 100 features, you could still have 100 subclasses. And if you wanted a combination of feature 1, 2,3 then you can still live with the 100 classes(not create any new classes ) . Feature1 can compose feature 2 (as a girl) which can compose feature3(as a girl). This brings me to ask the question again. Do we really need the abstract decorator or can we live with implementing the features as subclasses which compose a girl. In my humble opinion, latter seems to be OK.
Do you think that we still need the abstract decorator? Doing so can result in class explosion. What if the girl has 8 other features,and this 8 other features is needed on other area, and must have certain combinations. For example girl2 might have feature one and feature two, girl 3 has feature 4 and 5. Without decorator pattern, you need to create more subclasses. What if you have 100 features that has various combinations. Then you will need to create more subclassess. This will be a nightmare. I don’t know why we need GirlDecorator? Can Class Science and Art extend from Girl directly? 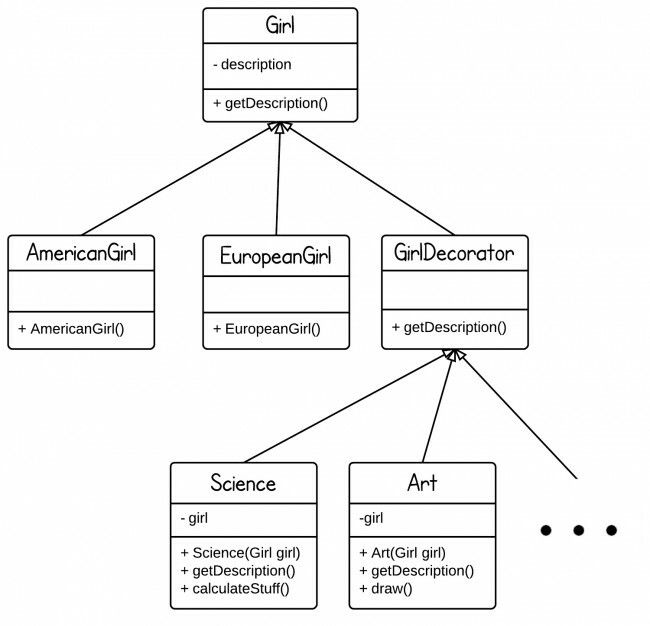 I don’t understand why should the GirlDecorator extend the Girl Class, the GirlDecorator is not a Girl at all. It’s IMHO anti-pattern. If you just want to have the Descprition method, you should implement an interface. I’m not sure if this is the best example..at the end of the main, our girl like both Science and Art, but she cannot calculateStuff, only to draw (because g3 IS-A Art).. She could calculate but not to draw if the order would have be the opposite…I’m not saying this is neccesarily “wrong”, but it doesn’t feel right either. I really think that the coffe example of the wikipedia (the second one in the page) is much better. Sometimes you read concepts all over the net with “intuitive”,”real-life” examples. Not all examples work for everyone. This one worked for me – had a light bulb glowing above my head. Thanx for this post and keep posting. How to “new” ? ! ! !